As you all know, Sikh Sangeet is pulling in Shabads from SikhitotheMax database so that we can show shabads on Sikh Sangeet website, as people are listening. However, we need your help in connecting audio shabads to their text. 3. Play the shabad if you need to. 5. When you search, remember to click the “Shabad” button in the search results. 7. In Sikh Sangeet, click the “Shabad” tab right below the track you just listened to. 8. Put the Shabad ID in that input box, and click the button “Add Shabad”. Once you have done this, I will make sure the info is correct and all sangat will be able to read the Shabad lyrics. To celebrate Guru Nanak Dev ji’s birthday, we’re putting out the next release of Sikh Sangeet. In this release, we’ve bridged 3 of our sites: forum, gallery, and SikhSangeet.com. So this means that when you sign up/in at SikhSangeet.com, you will automatically signed up/in at the forum and gallery, with the same login username/password. This will help create a simpler Sikh Sangeet interface and we hope you enjoy the effort that we’ve put to make this seemingly-simple integration possible. 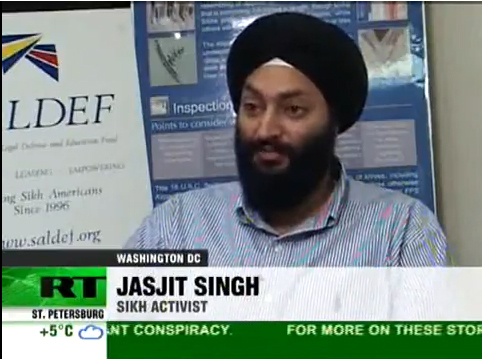 October 16, 2009 (Washington, DC) – Today, the civil rights concerns of the Sikh American community were featured on RT–an international English-language news channel broadcast to more than 200 million viewers in 100 countries on five continents throughout the world. Sikh people have been targets of intolerance, especially after 9/11 when the anti-Muslim sentiment in the United States was growing. According to a recent poll, 40% of Americans admitted to have a prejudice against Muslims. Oftentimes because of Sikhs’ turbans, they get mistaken for Muslims and end up becoming targets for hate crimes, work place discrimination, and racial profiling at airports. Today, because of their turbans, Sikhs still can’t enlist in the U.S. army and in some states they can’t teach in public schools. Sacramento, CA. October 11, 2009 – In a surprise blow to the Sikh community, Governor Schwarzenegger last night vetoed a bill that would educate law enforcement officers about Sikh articles of faith. The Governor’s decision came as a shock to dozens of organizations, communities and lawmakers who supported the bill. The veto was particularly surprising given the unanimous, bipartisan votes in favor of the bill through both houses of the legislature (77-0 and 36-0 in the Assembly and Senate, respectively). “This loss for the Sikh community is a reminder of our serious lack of political clout. After months of hard work and 100% support from our lawmakers, the Sikh voice was still not strong enough to overcome the whim of one man. We have been here for over 100 years, but as a community, we need to learn to exercise our political muscle and our voting power,” said Prabhjot Singh, the Sikh Coalition Board Chairman. AB 504 was introduced in February 2009 by Assembly member Warren Furutani (D-Long Beach) to use education to help stem the arrests of Sikhs for carrying their kirpans in California. Over the last few years, we have seen an increase in the arrests of Sikhs nationwide for carrying kirpans. Police mistakenly believe them to be in violation of the concealed weapons laws. 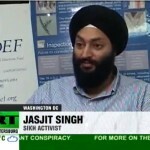 Such arrests violate Sikhs’ rights, waste taxpayer money, and have a traumatic effect on the person arrested. AB 504 was our first attempt to change this dynamic. Though the bill did not touch on the legality of the kirpan, it asked that police officers be trained about who Sikhs are and learn about the significance of the kirpan, in the hopes that religious understanding would decrease arrests. While some police and sheriff’s departments have recognized the need for this type of training and have been conducting it on an ad hoc basis, this law would have standardized and mandated the process state-wide. The bill would have been the first law of its kind in the United States. The veto came despite the bill’s broad endorsement by groups ranging from the Los Angeles County Sheriff’s Department and party consultants from both sides of the aisle, as well as several religious and civil rights groups. Every single California legislator was in favor of the proposed law. However, numerous efforts by Sikh community members to outreach to the Governor’s office prior to the bill’s consideration were greeted with no response from the Governor. We suspect that the final veto was the result of law enforcement’s strong desire to avoid promoting the acceptance of Sikhs with kirpans. The veto message was an outrageous response because the language of AB 504 was modeled on a similar bill about people on the autistic spectrum that was signed by the Governor last year. AB 504 was also drafted with input and approval from the Police Officers’ Standard and Training Commission (POST). Given his historic support of similar bills and the Governor’s unwillingness to speak with Sikhs about the bill, his veto is considered to be a direct rejection of California’s Sikhs. Governor Schwarzenegger is no friend of ours. The Sikh Coalition will continue to engage with POST in the coming months to encourage the training that was recommended in the bill. In addition, we hope to work with Assembly Member Furutani to reintroduce the bill in next year’s session. “I am committed to carrying this legislation again until this or any other governor signs it. I urge the Sikh community to stand with me as we continue this fight,” said Assembly Member Furutani. The Sikh Coalition would like to thank Assembly Member Furutani and all of the AB 504 co-sponsors as well as attorney Nitasha Sawhney, Mr. Nirinjan Khalsa, and the American Civil Liberties Union for their tireless efforts to shepherd this legislation through the bill process.